Building with blocks is one game or fundamental skill we learn as children. We learn about physics, we exercise reason, and we have fun building up houses or towers and knocking down the blocs de construction (building blocks) to start over all over again. Building is a fundamental element of adult society too. After all, it ensures that we have shelter, a place to live. It's not enough to have lots of old shelters that we recycle though, such as the one in which my family currently lives (dating from the first half of the 18oo's), or the knoll in an old plane tree in the middle of town now housing this particular pigeon family. New construction is important too, to accommodate growing populations, young families, and changing lifestyles. It is so important actually that 'construction starts' are seen as a major indicator of an economy's health or at the very least, its ability to recover in the event of an economic recession. Building and construction starts tell us how many constructions projects are started, and hopefully eventually completed, which affects multiple other economic sectors. Buildings after all need people to offer multiple services and products in order for these buildings, residential or non-residential, to be completed, used, and maintained. Construction is related to real estate which is then related to sectors that supply, distribute and sell consumer products, office products, building personnel. Construction also requires capital or lending, it may influence interest rates, and it certainly affect the level of tax revenues earned by our governments. So, economists pay attention to building and construction activity, to how many new homes are being built, and to the employment figures associated with that kind of activity. In France, construction is one of the sectors that remains weak, contributing to troublesome nationwide unemployment. (I wrote about this in Une porte fermée March 2013. ) Here in the south, building cranes are especially prominent over public works projects, as in Marseille where the city is still in the process of completing its Year of Culture preparations, but it is unclear how much the new construction is actually affecting the high unemployment rate in the city (some indicators suggest 16%, compared to 10-11% nationwide, Renier, Romain 7/0/2012 "Marseille: entre precarité..." La Tribune ). Meanwhile in Aix, other public works projects are beautifying the city, adding more pedestrian-friendly elements, and bringing in some housing. 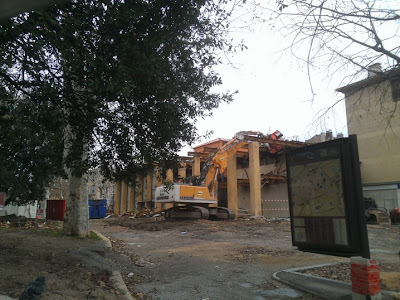 At least one major private sector non-residential project is underway, at the former site of the Aix tourist office which will be transformed into a new Apple retail store (see the initial demolition below, this past winter). Yet, even the slight improvement in the past months that Moody's credits to construction is still too light to improve the employment prospects here (Moody's Analytics 2013. ", Dismal Scientist: France ). Construction starts are important for the coastal town in which I was raised too, which has long been dependent on the logging and sale of lumber. Today's New York Times features an article about that town (with a nearly 14% unemployment rate), which is hoping that the slight improvements in construction starts nationwide will spur enough demand to allow a paper mill to reopen. (Click here Thompson, Kirk. 2013, April 15. A Mill's Fate Weighs Heavily on a Washington Timber Town, The New York Times.) As in France, since the mid-2000's , the U.S. has seen a significant decline in housing and non-residential construction ( Hadi, Adam. 2011, April. "Construction employment peaks..." Monthly Labor Review. Bureau of Labor Statistics), and this affects all kinds of communities, and not just the folks who are unemployed, but those who provide support services or even run or work at the local grocery stores and restaurants. The biggest difference though is that in France, some of the construction starts that are taking place are public ones. We don't see the state as active in our construction sector in the U.S. Unemployment benefits are higher in France (the minimum weekly benefits for 2013 in Washington state is $143 which is about 109 euros, while the minimum benefit is 193 euros in France, about $252), and they seem to last longer. So, creating jobs through public works is at least one way to get les sans-emplois (unemployed) off the dole in France, and perhaps spur some private housing investment. We'll see what kinds of building blocks the private sector is able to come up with in my little hometown.